Work and fixture congestion are slamming me hard right now, so you're getting the bullet point version of these match notes. I'll try to remain as sardonic as possible. Mesut Özil only appeared from the bench against West Brom on Monday. However, he won't be on the trip anyway. Francis Coquelin remains out through the international break with the hamstring injury he picked up against Bournemouth. Fixture congestion could start to become a bit of an issue for the players forced to go out every match in the center of midfield. As such, I'd expect Jack Wilshere to slide in here. Calum Chambers likely remains unavailable, having picked up a hip injury against Doncaster last week. Wenger is expected to go with a mix of first-teamers and youth, but Arsenal don't have enough depth at certain positions. Ainsley Maitland-Niles should start, but Alex Iwobi has a thigh knock. Laurent Koscielny, Aaron Ramsey, Mesut Özil, Alexis Sánchez, Granit Xhaka, and Alexandre Lacazette were all left behind. Predicted XI: Ospina, Holding, Mertesacker, Monreal, Bellerín, Maitland-Niles, Wilshere, Elneny, Nelson, Walcott, Giroud. There appear to be no injury concerns for Borisov, at least according to my sources. As such, it would be a surprise if they made any changes to the side that drew against Red Star Belgrade on matchday one. Predicted XI: Scherbitski, Rios, Gayduschik, Milunović, Polyakov, Volodko, Dragun, Ivanić, Gordeychuk, Stasevich, Rodionov. Arsenal appear to have righted the ship since their 4-0 loss at Liverpool; they're unbeaten in five since then and have conceded once across all competitions. That one goal was, of course, David Ospina's adventure outside of the box against Köln on matchday one. In the process, Arsenal have climbed from 16th in the Premier League table to 7th. They are three points back of Chelsea for 3rd. Belarus's season runs from April to November, so Borisov are 23 matches into their domestic season already. They have a four-match winning streak in the league, but currently sit two points back of top spot with seven matches to play. Borisov originally qualified for the second qualifying round of the Champions League, where they defeated Alashkert from Armenia before falling to Slavia Prague on away goals. They then fell to the play-off round for the Europa League, where they book their group stage ticket by defeating Ukrainian side Oleksandriya. 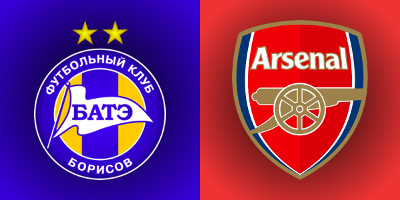 This is the first time Arsenal will face BATE Borisov in UEFA competition. Indeed, Arsenal have never faced a side from Belarus at all before tonight. Borisov have only once faced English competition, in the 2009 Europa League group stage against Everton. In a bit of a twist, the away side won each match. The match officials are from Poland. The referee is Daniel Stefanski. Stefanski has never worked a match for either side and has never worked any UEFA-level match involving a Belarussian side either. The only English sides Stefanski has seen came in the UEFA Youth League, where he worked a Chelsea win over Schalke in 2013 and a Manchester City loss to Juventus in 2015. John Painting is a contributing writer to the Modern Gooner and a a diagnostic instrument for measuring the curvature of the anterior surface of the cornea. You can follow him on Twitter @zorrocat if you think you might have astigmatism.